Amigüitos Cat Snacks are healthy and natural treats for your cat. The snacks are made of 100% fresh products. The treats are available in six flavours: lamb, duck, liver, chicken, beef and fish. The treats can be used as a reward or a snack. 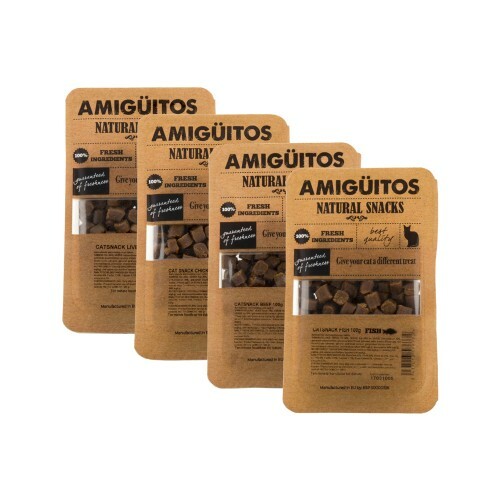 Amigüitos Cat Snacks are healthy and natural treats for your cat. The snacks are made of 100% fresh products. This means that no colourings or flavourings have been added to the product. The treats are available in six flavours: lamb, duck, liver, chicken, beef and fish. Amigüitos Cat Snacks Duck: fresh duck 30%, fresh chicken 20%, fresh pig liver 10%, fresh fish 10%, sprouted legumes, green peas, white peas, lentil, glycerol, dried seaweed, yeast, glucosamine. Amigüitos Cat Snacks Lamb: fresh lamb 30%, fresh chicken 20%, fresh pig liver 10%, fresh fish 10%, sprouted legumes, green peas, white peas, lentil, glycerol, dried seaweed, yeast, glucosamine. Amigüitos Cat Snacks Chicken: fresh chicken 30%, fresh turkey 20%, fresh fish 10%, fresh pig liver 10%, sprouted legumes, green peas, white peas, lentil, glycerol, dried seaweed, yeast, glucosamine. Amigüitos Cat Snacks Fish: fresh fish 40%, fresh chicken 20%, fresh pig liver 10%, sprouted legumes, green peas, white peas, lentil, glycerol, dried seaweed, yeast, glucosamine. Amigüitos Cat Snacks Liver: fresh pig liver 40%, fresh chicken 20%, fresh fish 10%, sprouted legumes, green peas, white peas, lentil, glycerol, dried seaweed, yeast, glucosamine. Amigüitos Cat Snacks Beef: fresh beef 30%, fresh chicken 20%, fresh pig liver 10%, fresh fish 10%, sprouted legumes, green peas, white peas, lentil, glycerol, dried seaweed, yeast, glucosamine. Have you used Amigüitos Cat Snacks before? Let us know what you think about this product.